Gov. 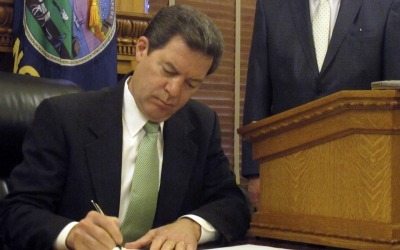 Sam Brownback signed legislation Wednesday to bolster the long-term health of Kansas' public pension system. TOPEKA, Kan. (AP) — Gov. Sam Brownback signed legislation Wednesday to bolster the long-term health of Kansas’ public pension system, but he also said he’s hoping a study commission set up by the new law hashes out the details of moving the state toward a 401(k)-style plan for new teachers and government workers.